Happy Sunday! This week was a bit of a step down from the crazy amount of workouts I did last week. I didn't bike or cross train nearly as much as usual, but sometimes your body just needs a rest. I still fit in all of my runs as usual, so I would still consider it a successful week! I also got to visit my alma mater for some runs this weekend (come back tomorrow for a recap of what I did!). 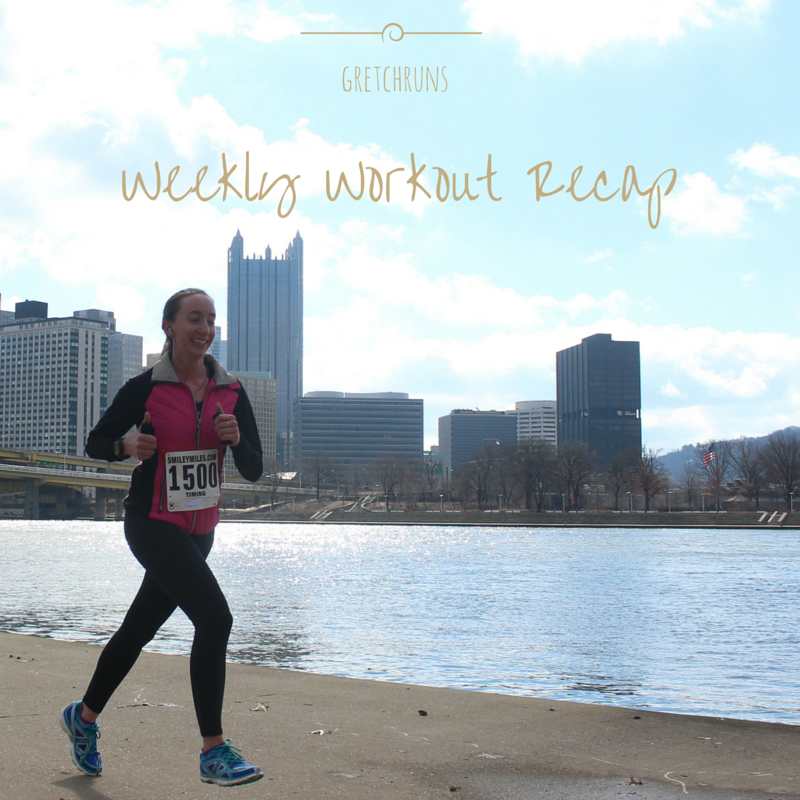 Let's get into my workout recap, and enjoy the remainder of your weekend! Sorry for the lack of photos this week, but most mornings it was dark and gross out. What happened to the beautiful sunrises? I guess it's time to bring back my reflective vest! After work, I spent about two hours walking dogs at the Humane Society. By the time I got home around 6:30, I was completely exhausted and the last thing I wanted to do was go for a run outside. I decided to go to the gym and run on the treadmill (which I hardly ever do). It was a great decision because I felt absolutely amazing! I usually take it really easy on the treadmill and work myself up to 6.0, but this time I started at 6.0 and ended at 8.0. It was one of those days when everything felt great and I felt like I could run forever! Track Tuesday workout was 6x400 with a mile warmup and cool-down and 400m jog between. My legs felt heavy and sore for most of the run, and it was already hot and humid when I started at 5AM. The high for the day was 90 degrees, so I kept telling myself that I had it easy! I ran each 400 at around a 6:30 pace, which felt comfortable but hard. Rest day!! Normally I try to get at least some activity in on my "rest" day, but I decided to take the day completely off. It felt good to relax, and Dan and I got to take Selma on a long walk to the park at dusk! Today was one of those days where things started out really rough but gradually improved the longer I ran. I felt really stiff and sore at the beginning. Towards the 1.5 mile mark I started to feel a lot better, despite the 75 degrees with 100% humidity at 5AM (better than running after work when it's over 90 though!). This was supposed to be a 35 minute tempo, but instead turned into a progressive run. Rest Day #2!! I don't usually take one full rest day in a week, let alone two, but I just felt like I needed the extra rest this week. I was also traveling to Penn State after work and slept through my alarm to run before work. What are you going to do!? Ran on the Sunset Park trail at Penn State with my friend Arianna! This is where I did all my training for my first half and full marathon. It was a great run! Ran around campus in the morning. It's so beautiful and I'll share pictures tomorrow! Felt surprisingly good after staying out really late the night before dancing! Those are nice workouts, Gretchen! You're travelling and it's stepback week - you're good! :) Can't wait to see your pics and hear your travel tales! Very nice week. This week was just so humid and it made even the early runs seems bad. Hopefully this week the weather starts to mellow out. Must have been so nice to run on your old training run route with your friend! You always work so hard. Don't feel guilty about taking complete rest days! Being older, I relish those rest days. My body needs to repair itself. I've noticed how much darker it is now when I run in the mornings. I guess our extra daylight is slipping away. I'll miss that morning sunrise :( and I agree..rest days are necessary! Your week looked awesome, Gretchen!! Rests are definitely important too :) you know how to listen to your body!